We are just 14 days away from Christmas and I've rounded up a gift guide for everyone on your list. 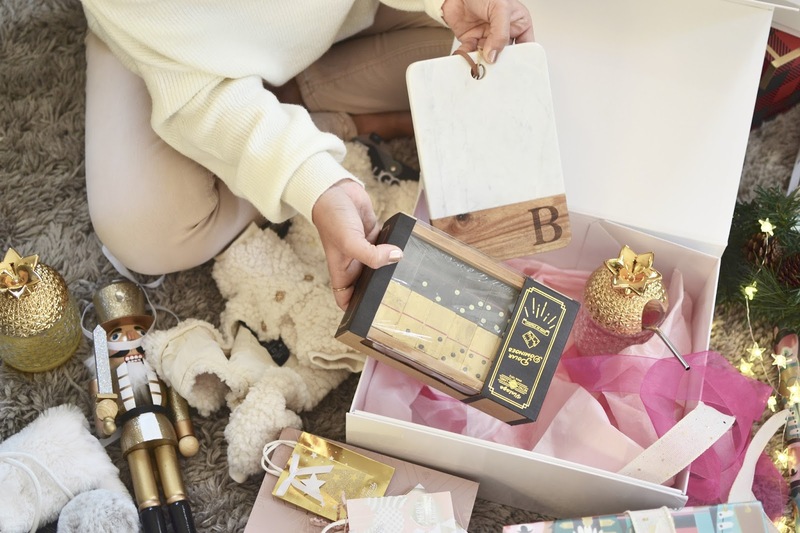 I am always looking for presents that are thoughtful and match the person's personality and this year I gathered up some cute gifts that won't break the bank and the best part it's a one stop shop! We all have that one friend who loves to chill at home, on the couch to watch a movie or binge on Netflix! (I am low key that friend sometimes!). Cute mugs are the perfect gift for just about anyone, add a good box of hot cocoa, their favorite coffee or tea and voila! This ED by Ellen DeGeneres mug is so cute and absolutely #InstagramWorthy, at just $9.99 you can't go wrong! Makeup and skincare are a must for a girlfriend or two, even your mom would love this gift and it's even a great idea as a stocking stuffer. Bed Bath & Beyond has a nice variety of beauty gift sets for everyone on your list, at every price point. I picked up this super cute L'Oreal lipgloss set in all the best fall shades, I added a set of my favorite Essie gel polish and wrapped it in a cute box. A nice personalized cheese board (just $11.99! ), some fabulous pineapple tumblers and a good dominos set will have you at the top of the list for best gift giver this year! I loved this gift so much I even picked up this adorable pineapple tumbler set for myself, at just $19.99 I couldn't resist. I am that person, I want to buy myself everything I buy others (no shame in my shopping game!). Bed Bath & Beyond has the best gift ideas for the host or hostess in your life. You know I had to pick up some cute toys for my kiddies as well. Ben will love this Ms. Pacman game and I think Emme will too! I love old-school memorabilia and this is perfect for all of us. It was only $19.99 and if you use your 20% coupon you can save an additional $4! This year I am on a budget for the kids, because let's face it, they don't need any more toys than they have. Emme loves blocks and legos and when I saw this magnetic tile set I immediately knew we had to get it! It's also a great gift for your nieces and nephews, gets the creativity going. We all have that one picky friend that no matter how much we try to get creative with, nothing comes to mind when giving them a gift for the holidays. Gift cards are always an easy option and the best part is that they are able to buy themselves whatever they want or need. If you want to make it more personable, get a cute gift card bag like these from BBB. They have super cute boxes and bags that will make your gift cards stand out. Most importantly make sure you enjoy the season and remember that the best part of gift giving is to give with love and to make memories this holiday season. You can shop these ideas and more at Bed Bath & Beyond. This post is a collaboration with Bed Bath & Beyond. As always, all opinions are my own.